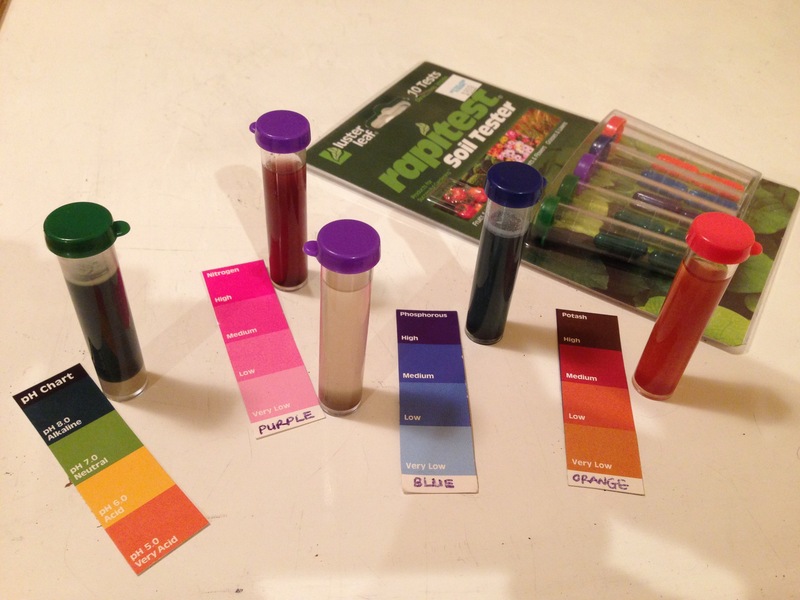 Collect soil and test for pH, nitrogen and phosphorus. Relate to the chemistry of soils. Walk to collect soil from various sites around the school/neighbouring park. Add collection sites to a map. Take soil from 10cm below surface to make sure the chemistry of the actual soil is measured. Mix 1 part soil with 5 parts water. We added 5ml soil to a tube, then water to 30ml. Shake 1min, then settle 10 mins (allow to settle on walk back). In class, filter the soil, by carefully pouring the water that is above the settled sediment through a coffee filter paper into a new tube. Some soil samples will now be clear, some will not. Run again until they are as clear as they can be (so that colour tests are easier to see). The first chemical test of our soil samples is for pH, which measures how acid something is. Soil does not get extremely acid, or extremely basic in the other direction, but it will vary enough to affect what can live in it. Our instructions for testing: Add pH powder from capsule. Add 4ml of the liquid to tube. Shake 1 min. Record pH. 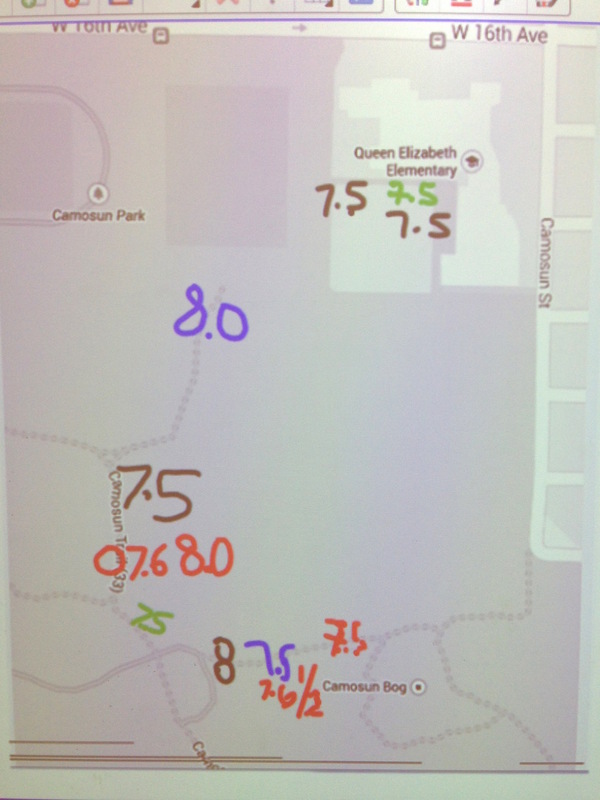 See the map image for the soil pH readings we got from around a school and neighbouring park. What might affect how acidic or alkaline soil is? Rainfall: Acid soils are most often found in areas of high rainfall. Excess rainfall leaches base (the opposite of an acid) from the soil. Additionally, rainwater has a slightly acidic pH of 5.7 due to a reaction with carbon dioxide in the atmosphere that forms carbonic acid. Weathering of minerals: rocks are broken up and washed into the soil, and affect its pH. Plant root activity: plants release H+ ions from the root. Acid rain: When atmospheric water reacts with sulfur and nitrogen compounds that result from industrial processes, the result can be the formation of sulfuric and nitric acid in rainwater. The amount of acidity that is deposited in rainwater is much less, on average, than that created through agricultural activities. Fertilizer use: Ammonium (NH4+) fertilizers react in the soil in a process called nitrification to form nitrate (NO3−), and in the process release H+ ions. Different plants are adapted for different amounts of acidity. Bogs are usually more acidic. Potting soils are manufactured to be neutral so that a wider range of plants can grow in it. 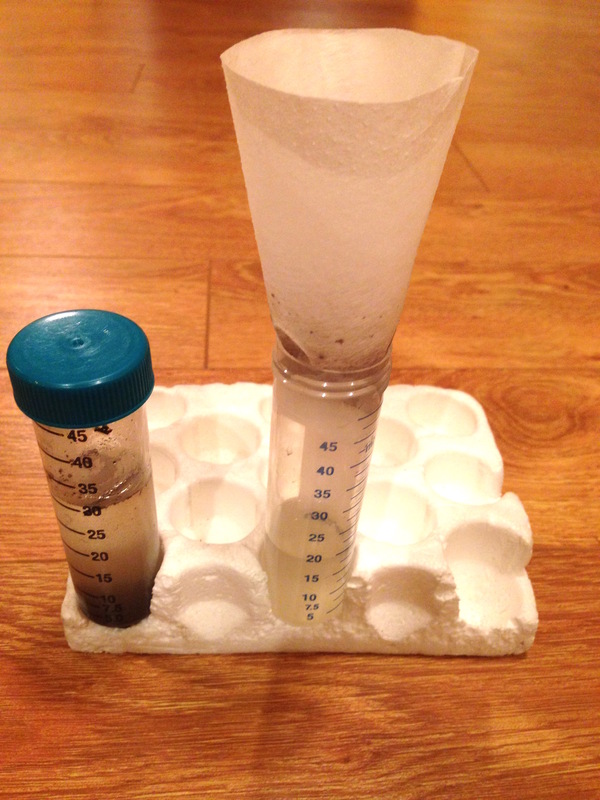 Instructions with our soil test kit: Add N/P/K test powder from capsule. Add 4ml soil liquid. Shake 1 min. Allow colour to develop - about 10 mins. While the colour is developing, look at the chemistry of one of these in the environment: nitrogen - do the "molecular modelling of the nitrogen cycle" activity. Our nitrogen results (pink) were very low - what does that mean? Not much nitrates. The nitrogen might be in other forms: nitrite or sequestered in the plants and animals. (One of the potting soil tubs had higher nitrogen). Nitrogen is needed for proteins, and chlorophyll, which makes the leaves green. If plants turn yellow, they may need fertilizer. Phosphorus was very low in woods, higher in one potting soil. Phosphorus has a whole other cycle. Needed in plants for photosynthesis. We need it to make ATP, which carries energy. In whole grains and nuts. Potassium was higher everywhere. Whole other cycle. Needed in plants for photosynthesis; proteins. We need it for our nerves to fire. Many other minerals needed by plants. We eat the plants and get them too.